Mitsui Chemicals, Inc. (Tokyo: 4183; President & CEO: Tsutomu Tannowa) has successfully developed AIRYFA™, the world’s first flexible nonwoven with high strength by exploiting its proprietary polyolefin spinning technology. 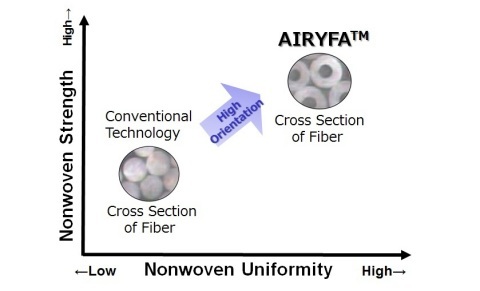 AIRYFA™ is a high-performance nonwoven that is gentle on skin, simultaneously materializing softness and strength. By capitalizing on the company’s proprietary polyolefin spinning technology and producing this thin textile with a hollow structure that is characterized by a superior soft feeling and evenness, Mitsui Chemicals has simultaneously realized both softness and strength, which the conventional technology could not achieve. This is an eco-friendly nonwoven that takes global environmental issues into consideration since the thin textile with a hollow structure reduces the amount of plastic used as a raw material. The name AIRYFA™ is intended to represent airy (very light and soft) fabric. Mitsui Chemicals has developed various high-performance nonwovens, such as bulky and highly flexible nonwovens, nonwovens with excellent elasticity, and the new nonwoven AIRYFA™ for sanitary goods, including disposable diapers. To reinforce its leadership in Asia, Mitsui Chemicals, as a solution provider capable of meeting customers’ requests for quality improvement, will continue to contribute to an enhanced Quality of Life (QOL) while further developing new high-performance nonwovens.